Just when you think the world has gone bonkers, you hear about Sirina and Anisa Prasad. The twins are Staples High School’s valedictorian and salutatorian, respectively. They’re warm, wonderful girls. They work hard in school, at the subjects they love (math, science, economics, English, the environment — everything, actually). 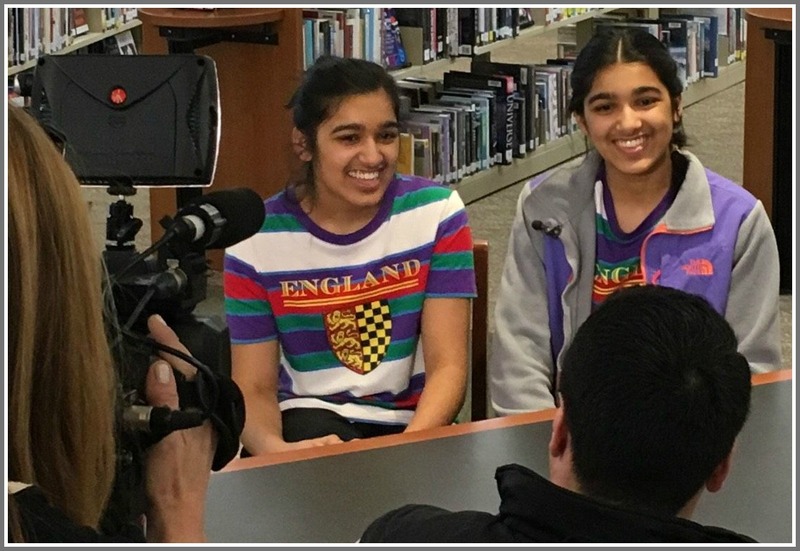 They started a Staples Science Olympiad team, competed in the Federal Reserve challenge (and advanced to next month’s semifinals), and spent the summer researching solar cells. The year before, they interned at a water quality lab. But they also knit, bake and play video games. They enjoy each other, and their friends. They never planned on being Staples’ top 2 students. It just happened. And everyone is delighted for them. WNBC Channel 4 sent a crew to interview them today (Thursday). The segment is scheduled for the 5 p.m. news. Valedictorian Sirina Prasad (right), and salutatorian Anisa Prasad, on camera today. I have no idea what they’ll say. But I know they’ll say it well, and with plenty of enthusiasm. And I’m sure they’ll be smiling all the way through. FUN FACT: The Prasads are not the first twins to be valedictorian and salutatorian. Eric and Todd Lubin turned the double play in 2011. This entry was posted in Education, Media, Staples HS, Teenagers and tagged Anisa Prasad, Sirina Prasad, Staples High School salutatorian, Staples High School valedictorian, WNBC-TV. Bookmark the permalink. These two are going places in life! Maybe they’ll become famous doctors. Whatever they do, they both will be a huge success, and I’ve never met them, nor their family! Check this posting in 15 years and you’ll see that I’m right! My guess is they come from a stable family environment which stresses the value of education and hard work. They’re also self-motivated. Check my comment in 2034! This is one of the coolest stories I have seen on “06880.” Congrats to Sirina and Anisa. I hope at least one of them will be going to Yale! Close. They are both going to Harvard.